This past summer, I had the amazing opportunity to go to Italy for work. My boss and I traversed the north of the country, gathering information to build classes and content we’d share with our members. It was a fantastic experience. I hadn’t been to Europe for years, and I also hadn’t “learned experientially,” as I like to call it, for a very long time. Exhausted after a full day, I’d realize how much information I’d picked up along the way. It was like an adult field trip. We also ate and drank extraordinarily well, a not-insignificant perk of the job. There is a lot I could say about that trip—so much that for months, I had an awful time trying to write anything about it beyond what landed in my journal. It was such a meaningful experience for me, and though it seems backwards, the things that matter most tend to be the hardest to put into words. But that’s not the only reason for the long delay in writing this: I had to figure out the potizza. Let me back up. On this trip, we crossed nearly the whole northern part of the country by car. We watched the landscape morph and change, actually grasped how far one place was from the next, stayed in a variety of cities large and small. We started in Turin and went west first, then reversed course and came east. At the far edge of the country, we arrived in Friuli-Venezia Giulia, Italy’s last stop before Slovenia. We pulled off the highway and started down winding roads en route to our destination for the night. 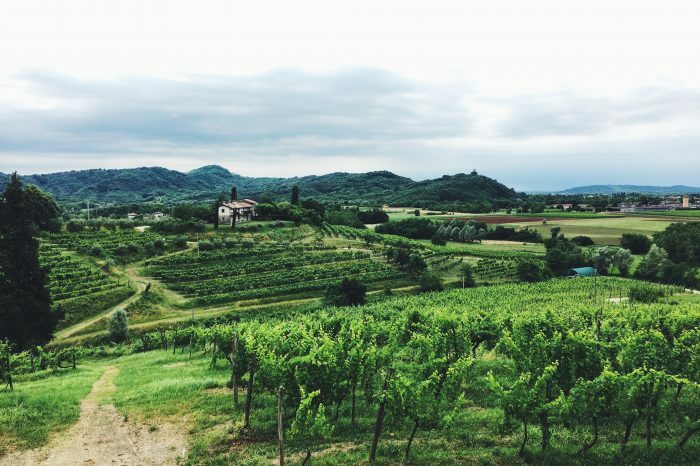 Rounding a corner, we were suddenly confronted with the most amazing view: vibrant green rolling hills dotted with deep brown houses, vineyards twisting through the landscape, dark hills hovering at the horizon topped with puffy white clouds. I will never forget that moment. I swear to you, this place looks like something out of the pages of a fairy tale. And then we arrived at La Subida, in the comune of Cormons, part of the province of Gorizia. I have been to few places so charming as this. La Subida is a hotel of sorts—a rustic, upscale bed and breakfast, you could say. 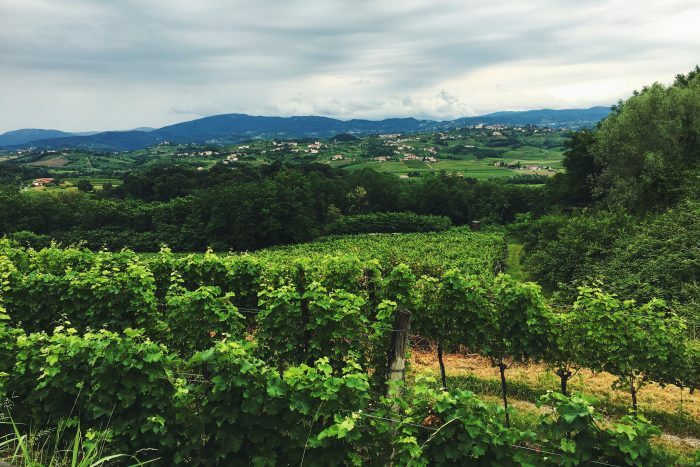 Sitting amidst the vineyards of the Collio Goriziano, it’s made up of a bunch of little houses and structures tucked into the woods on both sides of the road. They have horses and gardens and trails and two excellent restaurants and bright yellow Vespas you can rent to tour around for the day. 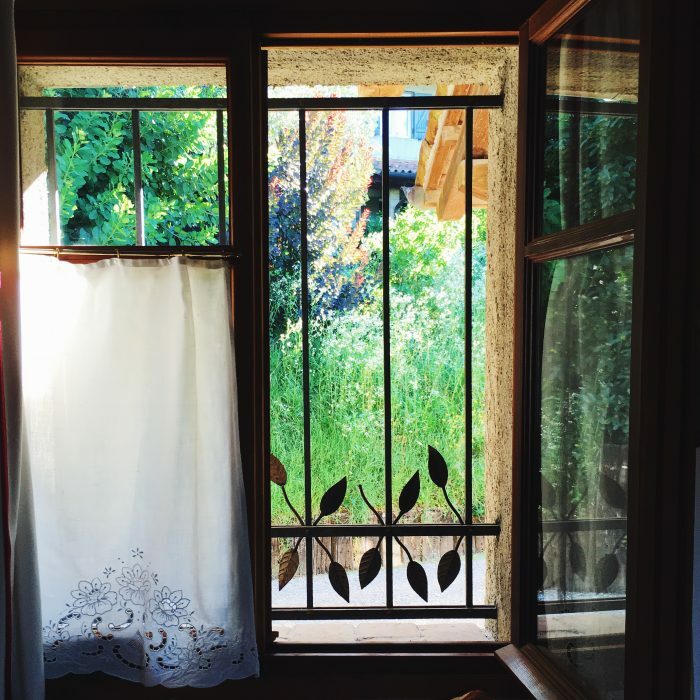 We checked in with Mitja Sirk, whose family owns the place, and he jumped on his bicycle to lead us to our rooms down the street. When my boss and I met back up for dinner, he said he’d just texted his wife to tell her he’d someday bring her here. I’d texted Ben the very same thing. That’s the kind of place this is, one that begs to be shared with the person you love. Dinner at La Subida, where Mitja oversees a fantastic wine cellar, was refined yet rustic. But breakfast was exceptional, too. The spread included thick local yogurt with lots of toppings: big pumpkin seeds, fat raw hazelnuts, poached prunes, various jams. There were breads and cheeses and cured meats and fruits. And there were pastries. Every morning there were several different ones, usually a fruit tart with perfectly latticed pastry, a dense cake and an option more akin to a bread. They were humble and not too sweet, just my kind of treat. In the three days we were there, I sampled a few; all were lovely. Back home, still thinking fondly of Fruili, I asked Mitja if he might be able to share a recipe for one of their morning baked goods. Generously, he did. 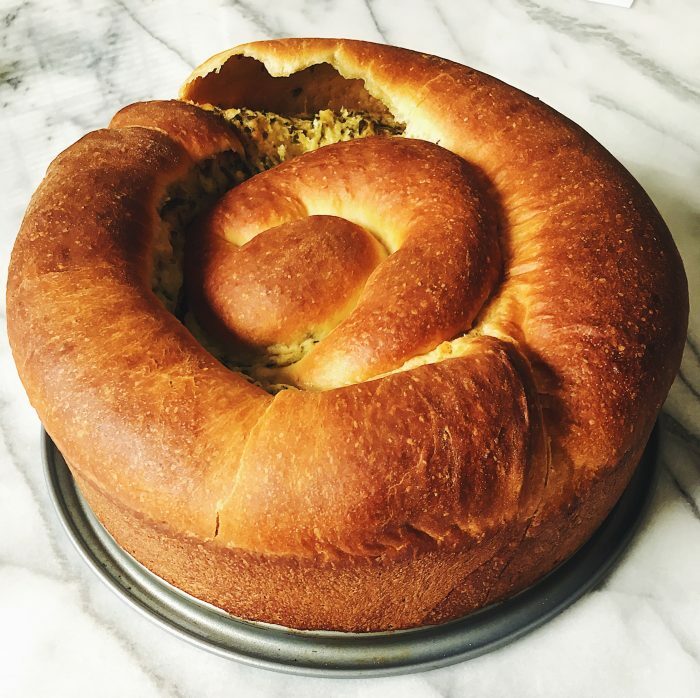 It was for a cake that had caught my attention, a yeasted affair with swirls of a slightly sweet herb spiraling throughout. 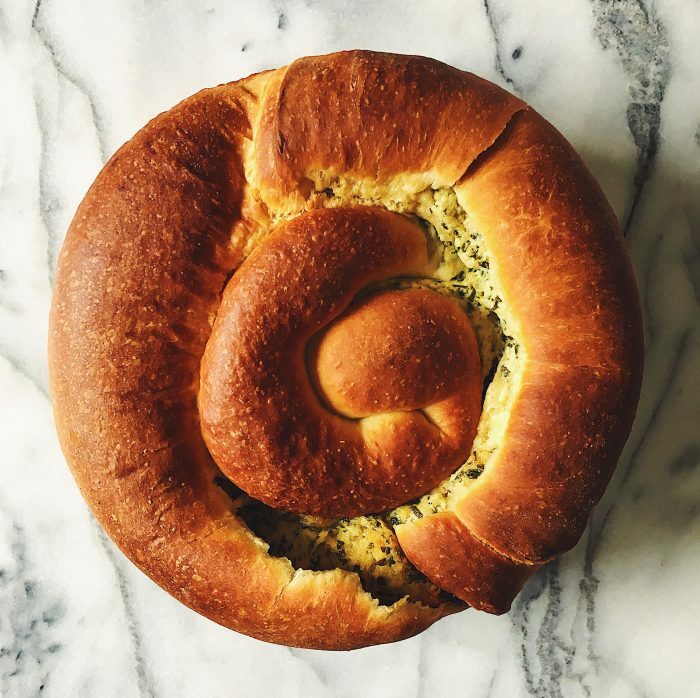 Mitja explained that this was potizza, a bread made with fresh ricotta and dragoncello, a local variant of tarragon. The recipe he gave me was written in Italian, for an enormous quantity of cake. It called for brewers yeast and included a line that translated to “give it the shape of potica.” Clearly, I had some work to do. Research revealed that the bread goes by various names depending on the country: putiza or potizza (Italian), potica (Slovenian) and povitica (Croatian). It is a yeasted dough that’s rolled thinly, filled, tucked into a pan (various shapes are acceptable) and baked. The most common and traditional filling is a mixture of walnuts with honey or sugar. But the ricotta and tarragon cake is special and, as far as I can tell, limited to a very small corner of the region. 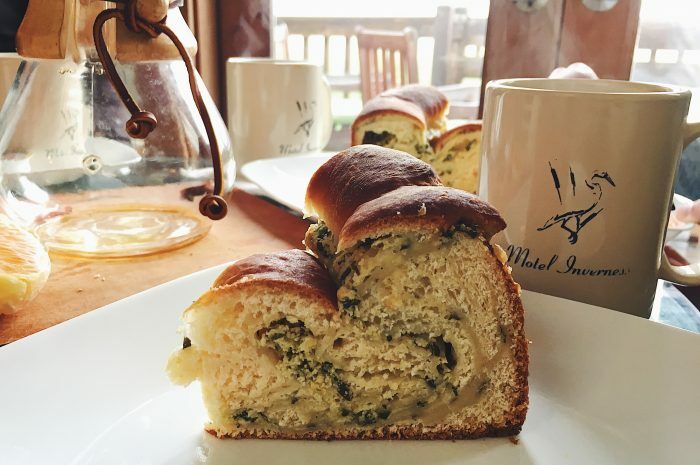 I found only one English-language reference in my searching, from the Wikipedia entry for tarragon: “In Slovenia, tarragon is used in a variation of the traditional nut roll sweet cake, called potica.” The bread, Mitja explained, was historically made for Easter, blessed that day, and eaten for luck. Only the rich could afford the ricotta and herbs; those with less means simply made the bread. It took me a few rounds, but I have a beautiful recipe to share, just in time for Easter. The tarragon adds a lovely and unexpected savory note, with hints of licorice and an herbal sweetness. It swirls through the bread, reminiscent of the green hills of Friuli. I’m totally charmed every time I make it, swept right back to that magical place. And this is something I love: there’s this tiny corner of Italy I once knew nothing about that enchanted me more than I can possibly express, where Italy’s culture and history bump up into Slovenia’s, and the hills curve and roll from one tiny town to the next, and a drive down the street might take you over the border and back. In this breathtaking region, people eat a variation on a rolled sweet pastry that isn’t replicated anywhere else in the world, along with frico and beautiful pastas and local cheeses, all washed down with white wines of various stripes and rustic Schioppettino and bracingly bitter amaro. And I had no idea that it existed. What a wonder, this world. I really recommend a stand mixer for this dough; it’s quite firm and takes time to come together. I imagine you could do without, using your hands to knead if you have the strength and time, but I haven’t tried this yet myself. Let me know if you do! I’ve given a range for the amount of ricotta. The original recipe called for 16 ounces, but as I tested the recipe, I inadvertently purchased containers at other weights, and I’ve had good luck with 12, 15 and 16 ounces. The more ricotta you use, the more fragile the cake, so you can go with less for an easier time—or just pick up whatever is handy at the store. Regardless, do spring for something of high quality, a ricotta that is tasty on its own and not too grainy. I like to use a springform pan so that I can remove the cake easily for serving—it’s beautiful, after all! Make sure your pan has at least three-inch sides. In the bowl of a stand mixer fitted with the dough hook, combine the flour, sugar, yeast and salt. Mix gently as you add the milk in a steady stream. Then add the egg yolks, one at a time, followed by the butter in three additions. Mix on a higher speed until the dough comes together and pulls away from the sides of the bowl. This will take several minutes, so be patient. Form the dough into a smooth, soft ball using your hands. Place it in a large, clean bowl and cover it with a clean dish towel. Let the dough rest in a very warm place until doubled, 60 to 90 minutes. Shape the dough into three balls, about 320g each. Let them rest for another 15 minutes. Meanwhile, add the lemon zest and chopped tarragon leaves to the 150g sugar. Blend them together with your fingers until fragrant. Fold in the ricotta and the vanilla. Once the balls of dough have puffed up, on a lightly floured surface, roll out one ball of dough very thinly (about half a centimeter) into a large rectangle. It should be at least 12 inches on the shorter side. Spread a thin layer of the ricotta mixture on the dough (about 2/3 cups). Roll up the dough into a log, as you would if making cinnamon rolls, and squeeze the dough together at the ends so that the ricotta mixture doesn’t leak out. Butter a 10-inch pan with at least 3-inch sides. Place the log of dough into the pan, then repeat the rolling and filling process with the other two balls of dough. The loaf will look beautiful no matter what, but if you’re looking for some direction, I usually curve the first log along the side of the pan, then overlap the second somewhat so the ends don’t line up, and keep going around the pan. I swirl the last one nicely in the center. Tuck in the ends as you go, and make sure your pan isn’t filled higher than the brim. Let the dough rise again, for 45 to 60 minutes, until it has expanded in the pan, then bake at 350 degrees for 40 to 45 minutes. If the cake is browning too quickly, tent it with foil for the last 5 to 10 minutes. Set the cake on a rack to cool completely before removing from the pan, slicing and sharing! Oh my! This is beyond lovey- the potizza- yes- but the entire post. What a wonderful opportunity for you. Thanks for sharing the photos too. Dreamy!!! The only problem is that I’m a bit stressed that I haven’t gotten to the cardamom tea cakes yet! ;) Maybe this weekend. Happy Easter to you, too, Stacy. God’s rich blessings! I absolutely love your story of your trip, and this bread is absolutely gorgeous, and even more special knowing where it came from. Thank you for sharing. This bread was wonderful! Thanks for making it while we were visiting you! I am definitely going to try making it myself. Thanks for doing all the work of research and recipe testing. The photos of Italy are beautiful, and I’m sure you have the added benefit of remembering the place you first tasted it when you eat this bread. I’m ready to attempt this, but I have 2 questions: Why use European butter? When I roll out the dough, if it is 12 inches on the short side, approximately how many inches is it on the long side? European-style butter has a higher butterfat content, so it behaves a little differently (affecting the rise, moisture content, etc.) and has a richer flavor. Since this is an Italian recipe, it’s safe to assume that’s what they use! However, I did make this once with American-style butter, and it worked fine. But if you can find European-style butter without too much trouble, I think it’s worth it here! Plugrá, Kerrygold and Lurpak usually aren’t too hard to track down. As for rolling the dough out, you don’t have to be too precise with the size, but a rectangle of 12×16 inches or so is about right.